An ex-convict and Catholic revert, Scott Woltze has walked the same route every week for three years, wearing his wool tunic, marked with the Sacred Heart of Jesus symbol. He and friends like Meagan Montanari who walk with him have had amazing experiences. “It’s really a matter of God putting you in the right place at the right time,” he says. 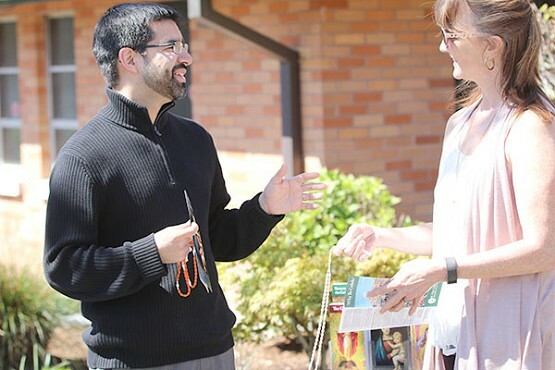 Felix Barba, leader for the local St. Paul Street Evangelization group in Portland, greets passersby with a smile and a rosary. Rosaries, he says, are a good way to introduce people to the life of Jesus Christ through his mother, Mary. 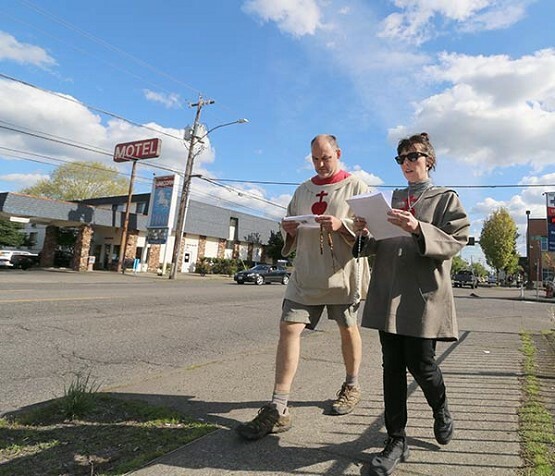 As he walks along Southeast 82nd Avenue in Portland, Scott Woltze wears a wool tunic marked with the Sacred Heart of Jesus symbol. He and his companions are praying and occasionally chanting. They look obviously religious. And that’s the point. Their garments are a signal for people, says Woltze, who has been walking this route weekly for the past three years. He, and friends who have walked with him, have had amazing encounters, especially near the Grotto. Woltze says the place has a strong gravitational pull on people on the cusp of conversion. Woltze says he is friendly. He makes eye contact but lets the people he meets initiate conversation. “It’s really a matter of God putting you in the right place at the right time,” he says. Woltze says he likes walking through the rougher areas. He has a heart for ex-convicts. Woltze is not a typical cradle Catholic. At 18, he was convicted of robbing three banks and was sent to a maximum security prison. When he wasn’t involved in prison politics, he read literature and philosophy. When he got out, he went to Portland Community College and then to the exclusive Reed College, where he earned a bachelor’s degree. While working on his doctoral studies in political philosophy, he encountered God and rejoined the church. art gallery where his wife worked, he was suddenly able to discern whether the people he passed on the sidewalk were close to God, far from God, or ready to convert. On his drive home, he passed a Mormon missionary and then a group of fundamentalist Christians standing on a corner. He knew he was being called to evangelize. Over the years, he has witnessed spectacular things and has grown himself. “I’ve been the prime beneficiary of my street evangelization,” he says. He is not alone in feeling this way about the ministry. Dawson started St. Paul Street Evangelization in Portland five years ago. What began as a few people going down to Portland’s river walk spread rapidly. The ministry is now in more than 300 cities around the world. Dawson says it’s the work of the Holy Spirit. “We weren’t trying to start an organization. We were just trying to do some evangelization,” he says. What the group provided was stunning — a simple and concrete way for any Catholic to get involved. Dawson says all Catholics are called to evangelize, but many have lost the drive. “Throughout the history of the church, Christianity has spread really through street evangelization,” he says. The St. Paul Street Evangelization has tapped into the desire of those faithful who want to spread God’s word but don’t know how. When Dawson started going to the river walk to talk to Portlanders, he wasn’t expecting to see a lot of spiritual fruit. He was planting seeds, leaving the work of converting hearts up to God. But from the beginning, he has been amazed at the number of people who’ve come back to the faith after witnessing evangelists in public. People would come to him, saying that they’d been really thinking about coming back to the faith, and then his group pushed them over the top. In the early days of the Portland ministry, priests would occasionally come along with the evangelists and hear confessions. Since Dawson left Portland, the St. Paul Street Evangelization group in the city eventually declined and recently has seen a resurrection. Felix Barba, youth and young adult minister at St. John the Apostle Parish in Oregon City, took over the group and has been reviving it. Every couple of weeks, he leads whoever wants to join to set up a spot at farmers markets, festivals or community colleges. He and his team hand out rosaries, miraculous medals and brochures explaining commonly asked questions. They offer to pray with people. The St. Paul Street Evangelization is nonconfrontational. “Obviously, just yelling on a street corner and all the condemnations is not the good news,” says Barba, who identifies evangelization as one of his spiritual gifts. He hears a lot of no’s when handing out rosaries, but sometimes people come to him and want to talk about their faith journey. He recounts stories of active Catholics, other Christians considering conversion and even atheists who’ve spoken to him — all in the past few weeks. Barba says he hasn’t encountered many concrete conversions. But that’s not really why he’s there. The goal for the St. Paul Street Evangelization is planting seeds in people’s hearts and being available. It’s not a complex ministry. Most people try to overcomplicate it, says Barba. “We try to keep it very simple and just encourage people to go out,” he says. Street evangelization is as old as the stories of the New Testament. The modern concept of believers standing on street corners was particularly important for the Paulist Fathers, especially before the Second Vatican Council. The method has changed, but street evangelization is still done by some Paulists, specifically in New York. “Their idea, and I think it’s the basically correct insight, is to open dialogue with people, to help people see spiritual and religious dimensions in their lives, which they usually do not recognize or consciously acknowledge,” Father DeSiano says. The process allows people to enter a conversation with “official representatives” of the church, giving them a chance to see a place for themselves as Catholics and as believers, the priest explains. For any Catholic feeling called to the ministry, Woltze suggests trying it and seeing what happens.